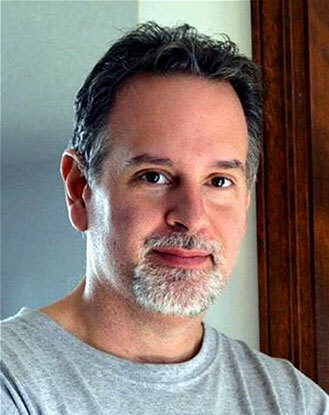 Michael Bonnardi is the co-founder of Sunday Morning Publishing, a family-run company based in Connecticut that sells books, photography, and gifts. After discovering some fascinating family photos and documents, he published two books, which are passing down his grandparents’ recipes to today’s home chefs—and their pets. When did you start Sunday Morning Publishing? I started it a few years ago. My mother passed away and I really began to reflect on my family’s history. To help remember, I was looking through some old photographs and a ledger from my maternal grandparents. As a way to cope with my grief, I decided to put them together, which is how Ralph’s Recipes was born,and then Diets for Dogs. Where did you find the photographs? I’ve had them for a few years now, after selling my parents house. You see, back in 1982 in Hamden, Connecticut, where I grew up, there was a really terrible flood. We almost lost our house, and the basement was full of water. Unfortunately, that was where we stored a lot of home movies, photographs, and other memorabilia. The old Super 8 movies and everything else—gone. It was horrible. I was literally trapped on the other side of town and I couldn’t get back to help my family. I felt guilty about that and it’s been in my subconscious over the last 30 years. Some of the things that did survive were the photographs and the recipes my grandparents had handwritten. They owned and operated a dog kennel back in the 1930s and 1940s. And they also had dozens of homemade diets for the dogs. They were all­-natural and they really planned everything out, down to the age of the dog, the quantity to be served, the time of day to feed, etc. I decided to take that ledger and translate it into two books. The first was Ralph’s Recipes and the second is Diets for Dogs. I wanted to get their history out there. It’s a time that’s much different than today. Did they describe what it was like to run a dog kennel back then? The ledger contained the information of the diets, but the stories were passed down in verbal form. Their business started in 1930, but they were doing so well that in 1938 that they spent a great deal of money to build a new kennel. This might be a shock, but the amount they spent was about $900. It may not seem like a lot, but it’s the equivalent value of around $175,000 in today’s money. 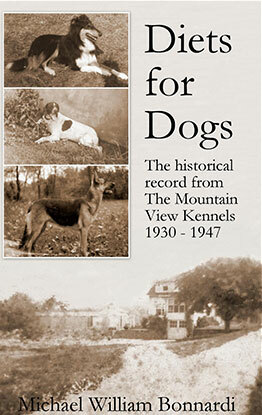 They ran the kennel until 1947, when my grandmother, who had Hodgkin’s disease, passed away. My grandfather closed the kennel and everything associated with it. I’m passing it on now in book form, so that people can know that they were real people, whose lives were much different than ours today. Do you think there are ways of life that people today would benefit from? Absolutely. I think today we’re all so consumed about everything being recorded and measured and analyzed. These recipes are about forgetting the clock, getting into the experience of preparing and cooking. Instead of worrying about getting everything right; slow down, lower your heart rate, forget about time, and just experience the moments. Being in the moment with family or friends, eating and conversing—all of that’s still really important. Were you a cook yourself before these books? I could boil a pot of water pretty much, but I became a better cook and got more comfortable experimenting. 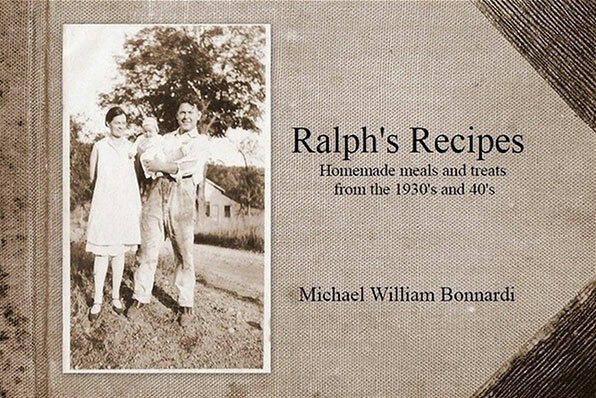 In Ralph’s Recipes, the original text has some changes and alterations in some of the recipes. They would use a cup of sugar, and we might use half a cup. It’s not measured and itemized like it is today. My wife and I will make crumb cake and we’ll say, “Hey, let’s have a little less sugar in this one,” or, “How about more flour next time?” so every time we make it, it’s a little bit different. In Ralph’s Recipes, you’ll make Fudge Squares, Chop Suey or Italian Spaghetti, and it tastes different than what you buy in the store because it only has simple ingredients. In the 1950s, everything became so processed and now we have all these problems with obesity—even in dogs too. The recipes in my books are all natural, the way things are meant to be. How have you published your books? They’re self­-published. I had sent Ralph’s Recipes and Diets for Dogs to several smaller publishers, who turned them down. So I decided to do it myself. Now I’m working on marketing both of them, and Onepager has helped a lot. Are there aspects of Onepager that have been useful in particular? Since it’s one page, it’s simple to use. Simplicity is important for the website, in what we’re doing with the books. With all the extras available on sites today, things can get confusing. Sometimes it feels like “I’ve got to have 20 buttons on my webpage because the other guy does,” but we realized we had to go with what was best for us. People will either like it or they won’t. What methods have you used to promote your books? My wife Maureen and I were able to appear in two segments on Connecticut Style on Channel 8 WTNH in New Haven. Everyone there was great and it was a lot of fun. Marketing can be a lot of trial and error, but you learn and say, “This worked. Maybe I’ll try something else and see if that works.” There’s an excitement spreading the word to different people. While promoting and talking with people, I’ve learned that if one person couldn’t help me, they’d usually point me to someone who could. You build a rapport with different people. If I could help them, I would be happy to. Whenever I speak to small businesses, it’s so apparent how effective word of mouth still is, even in this era of Twitter and Facebook. Exactly. You trust someone that you know and it’s really about making the connection. When you read blind reviews about something, they don’t strike you in the same way. I think that goes back to the old school philosophy; “I’ve used this great product or read this interesting book, and I want to pass it along to you.” Facebook, Instagram, and Twitter are new tools to help with that. Social media can act as a conversation starter, which opens a dialogue.